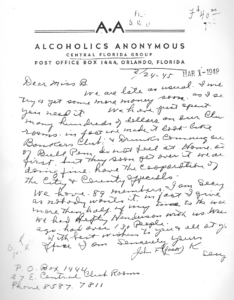 The preceding articles were based upon information obtained from tape interviews with Louise A., Jackie L. and Frank M., as well as correspondence between the Central Florida Group and the AA Service Office in New York. 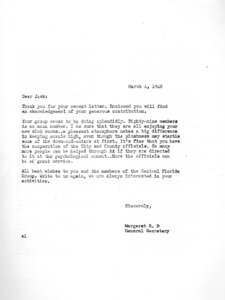 In previous articles, membership numbers were remembered as being 15-20 when Frank M. first came to the Orlando meetings, and from 4-40 as Jackie L remembers. This is all in the same period — 1948. The Twelve Traditions were already published in their long form, in the 1946 Grapevine, but not as yet ratified. That was to come in 1950. We can see in Jack’s letter (following) to the Service Office that the group was already practicing the Seventh Tradition. Their contribution was $40, a sizable sum in 1949 dollars. It would be well into the sixties before the General Service Office (GSO) established a Cooperation with the Professional Community (CPC) Committee. We see in Jack’s letter that the Central Group was already practicing this important function in 1948.